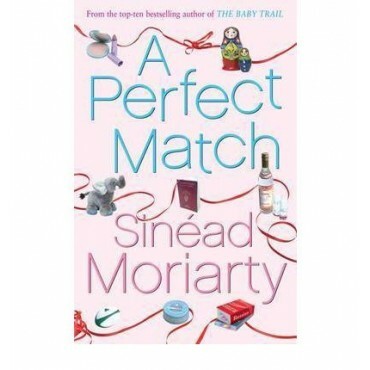 In her second novel, "A Perfect Match", Sinead Moriarty tells the story of Emma Hamilton who embarks on the path to adopting a baby when she and her husband can't conceive. It manages to be both hilarious and incredibly moving is comparable to the writing of Marian Keyes in its ability to balancing of light and shade. After two years of being deafened by the TICKTOCK of her biological clock and tormented by Mother Nature's refusal to grant her a baby, Emma Hamilton decides to go for the instant solution: finding a Russian baby in need of a home. But Emma hasn't reckoned on the route to adoption being so complicated. Between proving that she's fit to be a mother (by inventing an unblemished past and discovering an unsuspected talent for housekeeping), driving her long-suffering husband insane with madcap schemes to make them the perfect would-be parents (a few Russian verbs a night and they'll be fluent in no time), and tripping over red tape every step of the way (who knew social workers could be so terrifying?) Emma finds out that adoption is far from the easy option - and that perfection has very little to do with finding the perfect match. Sinead Moriarty's novels have sold over half a million copies in Ireland and the UK and she is a four times nominee for the popular fiction Irish Book Award. She has won over readers and critics telling stories that are funny, humane, moving and relevant to modern women. "A Perfect Match" is a follow-up to "The Baby Trail", but it also stands on its own as a complete story. Sinead Moriarty lives with her family in Dublin. Her other titles are: "The Baby Trail"; "From Here to Maternity"; "In My Sister's Shoes"; "Keeping It In the Family" (also titled "Whose Life Is It Anyway? ); "Pieces of My Heart"; "Me and My Sisters", and "This Child of Mine".